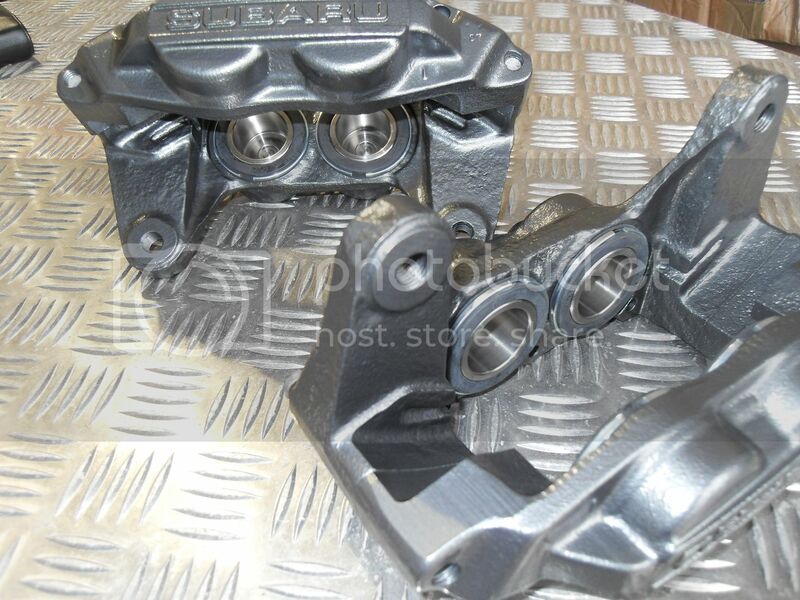 I can supply you stainless steel pistons for £15 each or £100 a set of 8 , for the 2001 onwards WRX you don't need the mounting brackets as the calipers fit straight on you only need the thicker handbrake shoes , we do these with the correct material for £125 a set , you can get them cheaper on ebay but they use the low temp material for machinery and conveyor belts ect which is not suitable for cars. Absolute top service Ian with my calipers a few months back! Prompt delivery, and wicked results! Hi Ian, can you also provide anti-knock back springs? What's your best happy new year, discount, sale price on a set of refurbed 4 pots (exchage) with new discs & pads including delivery? To fit behind the pistons ? Set of braided brake lines + some suitable brake fluid. A set we did for a customer last week in Honda pearl gold ! The latest set we have done for a customer who has bought some Alcon 6 pot calipers off ebay and wanted them Kawasaki green ! Our latest pair and probably the loudest pair we have ever done , you have been tango'd !! Can I have a price please for a full set of pistons and seals, discs and pads and braided pipes if you sell them for standard 4 Pots. Great, I will call you this morning to order everything. Last edited by JAutos; 03 March 2011 at 08:16 AM. Last edited by Rich_B; 07 May 2011 at 06:05 PM. Bought a set of your front grooved disks off you a few months ago, but I have now found that the 4 pots on my WRX Bug have one seized piston in each caliper. I would like to do the exchange service you offer but one of the calipers has some damage to face of it where it looks like a wheel with the wrong offset has been fitted at some point. Are you still able to offer the same deal ?